You may or may not have noticed that I’ve been sharing a new recipe every Friday. That’s because a group of friends have teamed up to make a new recipe each week for whatever the theme of the week is. It’s really just an informal thing, but I’m having lots of fun with it. This week the theme was “drinks”. We like to keep our themes pretty general so there’s more room to be creative and you’ll end up seeing a diverse group of recipes. With Valentine’s day coming up next week I wanted to make something that would be suitable to make for your sweetheart. 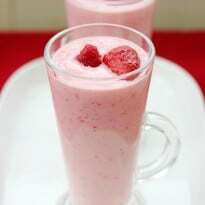 I came up with this Berry Jam Smoothie recipe. It’s sweet, creamy and a little decadent. It’s also very filling! I only had a small glass of it and I was full. Even John liked it and asked for seconds. Good thing I have extra ingredients in the fridge to make more. 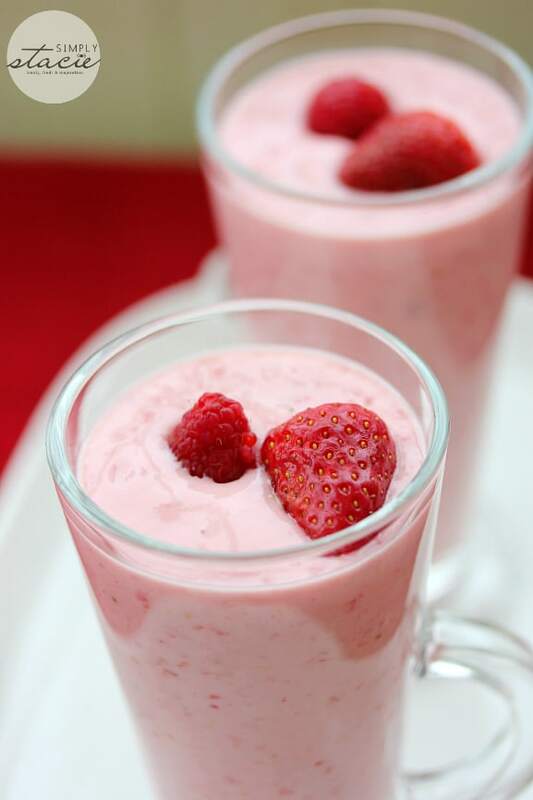 You can lower the sugar content by using plain yogurt or jam with no added sugar. For more yummy drink ideas, check out this recipe for Homemade Ginger Tea, Easy Chocolate Chai Tea, Creamy Banana Milkshake, White Hot Chocolate, Red Velvet Cake Milkshake, Fuzzy Navel Mocktail, Shirley Temple and Healthy Homemade Hot Chocolate. Sweet, creamy and a little decadent! Combine all ingredients in a blender and blend until smooth. I have a Smoothie setting on my blender and I mixed mine for about a minute. Add more milk to adjust the thickness to your preference. Makes about 1 to 2 servings depending how big of a glass you use! Thanks for sharing these look and sound fantastic!! I love smoothies of any kind!! These look berrylicious! 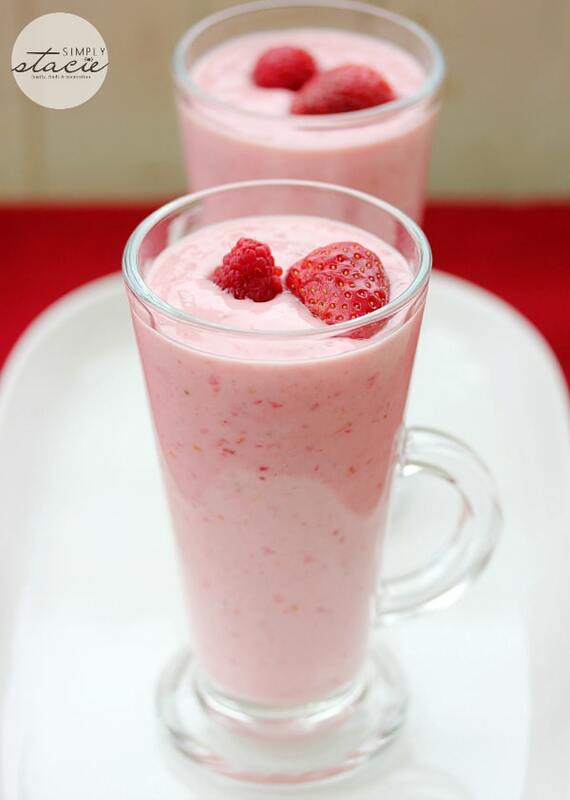 I love fruit smoothies! I’ll have to try this one out. Thank you for sharing…………..I have been recently been diagnosed with Type 2 diabetes and really have to watch my sugar intake. I can have this one and lower the sugar content but still feel like I am cheating. 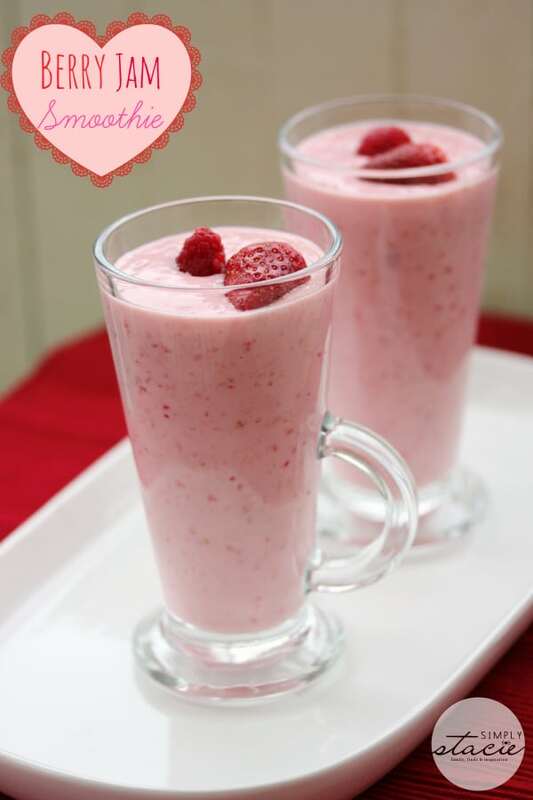 I love, love; love smoothies and strawberry are one of my favourites. This looks delicious Stacie!! I already have most of the other ingredients in my fridge! I’m going to try this one today with almond milk! This sounds good, never had a smoothie with jam, but willing to try it. Thank you for sharing this yummmmmmy recipe! I love smoothies and can’t wait to try this for my family. They will be so excited to try it too! PINNED! I have a smoothie for breakfast every day and am always looking for new ideas. Love the jam in this. Thanks for sharing! I’ll have to try this one out tomorrow when the grandkids visit,thanks for sharing the recipe.